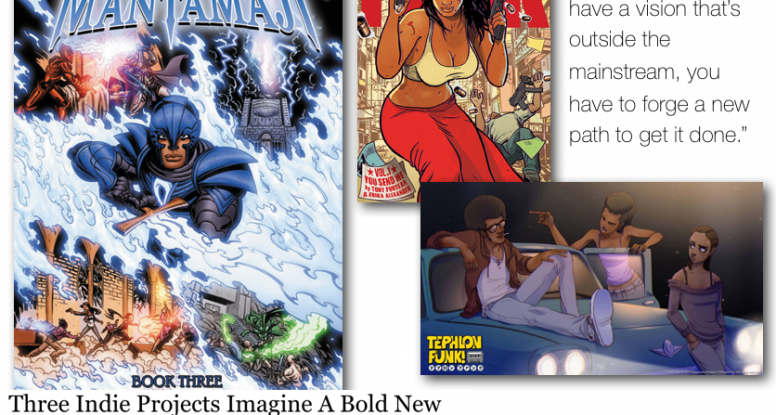 This week Rob Salkowitz featured Eric and Legend of the Mantamaji in his article on indie comics taking different routes to success. sometimes it turns out that when you have a vision that’s outside the mainstream, you have to forge a new path to get it done. Also featured are indie comic stars Concrete Park and Tephlon Funk. Seaton and Metayer say they were both partially motivated to do their stories because they had such a hard time finding good work featuring authentic black characters and black creators when they were growing up as fans. Puryear says he is proud of his African-American heritage, but bristles when people assume that his work is aimed primarily at black readers. “The future includes everybody,” he said. 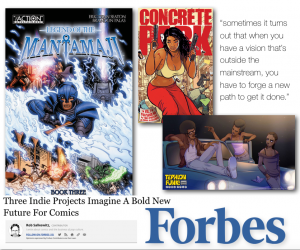 This is a great time to be an indie comic creator and an excellent time for creators to make those diverse comics that the community is clearly eager to own. Carefully weigh your options before going the indie route. It can be an additional full time job, but if you have a specific vision and a good plan, you can do it. Have a question about being an indie creator? Ask in the comment section below!